I was almost going to add this to my http://www.justveganit.com/ site and then realized that even though the ingredients for this dish were vegan and sugar free, the minimal oil criteria didn’t quite fit in here. Either way, this simple and yet elegant creation is perfect for an evening when you are not really in the mood of cooking something elaborate. You can start with some salad maybe and finish your dinner off with this dish. You will really enjoy this basil flavored rice with just a hint of heat and sweetness in it. Wash the basil leaves well. Add the basil leaves, olive oil, chopped green chili, raisins, and salt to taste in a blender and blend it as fine as you can. Set aside the mixture in a cup. You can even do this before hand and store it in the refrigerator. It should retain its freshness for a few days easily. Cook 2 cups of basmati rice, al dente (just cooked right, like you would cook rice for a pulav or fried rice). Please do not steam or pressure cook your rice as those processes will make the rice sticky. The best way is to pour the washed rice in boiling water (water level should be at least an inch and a half above the level of rice) and when the rice is done, drain the water similar to the way you would drain water from pasta. Let the rice cool down a little and make sure not much moisture remains after the water has been drained out. While this is going on, quickly chop walnuts and roast them on medium heat until they release their oils and are nice and brown. 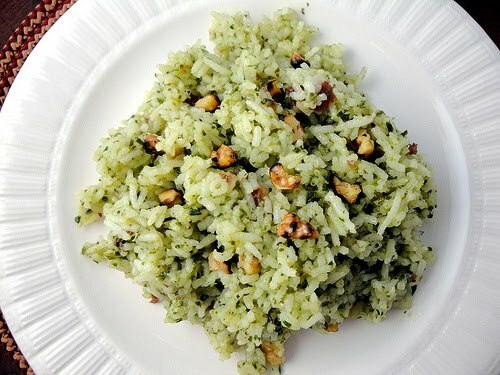 In a bowl, combine the rice, the basil paste and the walnuts. Add more salt according to taste. Serve hot.